People watching. A coffee, a guilty pleasure and a window. Having just finished blurting on my laptop (something I might show here at a later date), I take a swig and stare. Outside the hustle and bustle of the winter market - people moving to and fro between choices, or anxious to be elsewhere; stall holders hunched over goods or projecting outward to entice another sale. Taking a bite I unfumble my sketchbook from where it is wedged in my inner pocket and pick out a pen. I let my eyes wonder and my pen starts to react: a hat here, the slope of those shoulders, a hair do, a pair of glasses, a zig-zag crease in fabric or the angle of a head ducking against the wind. I love drawing people like this - there is no expectation, after all they will keep moving! It's all about the first line, getting an impression - making the mark on the page. A glance, an instinct - the hand moves - a spark is captured. 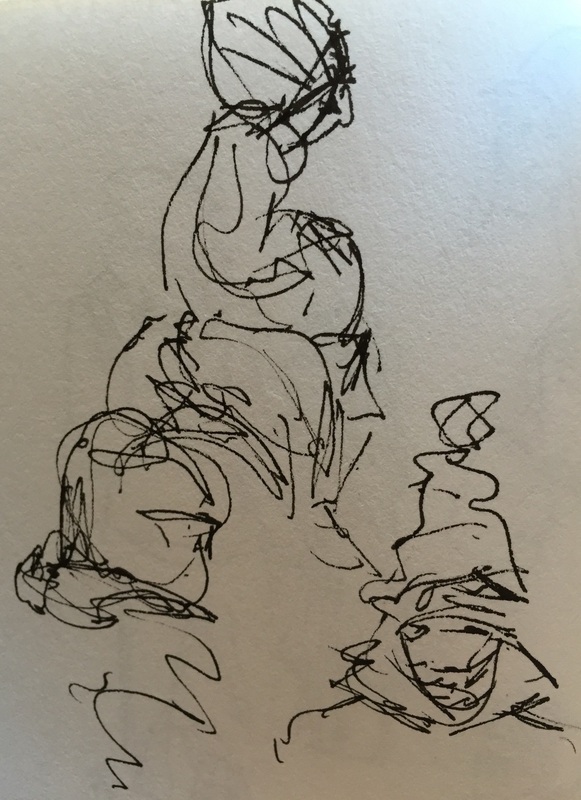 The more I sketch, the more a style grows - illustrating the scene, commenting on what I see - instict letting my hand move with freedom, finding lines and squiggles that grow out of the observation. Are these studies for a later painting - maybe? But more, it is with each glance I reconnect - remind myself that I am a part of the world around me. I find patterns in spaces - see connections in flickers of emotion, and absurdity in the dance of inconvenience as people find new ways to navigate the familiar. My phone rings. I find a way to bring the line to an end. I finish the coffee. Time is up - chores and tasks call, and I answer.